The view from the driveway to Montinore Estate’s winery and tasting room. The Marchesi family’s lovely home. 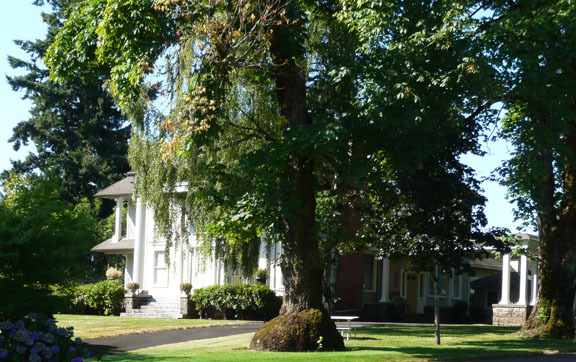 Looks like it’s the Old South, not Oregon! A composite photo of the winery’s entrance. The view from the tasting room. We started with a 2009 Reserve Riesling, 11.7%, $20. This still wine opens with pear and apple, lemon-lime, and cinnamon. 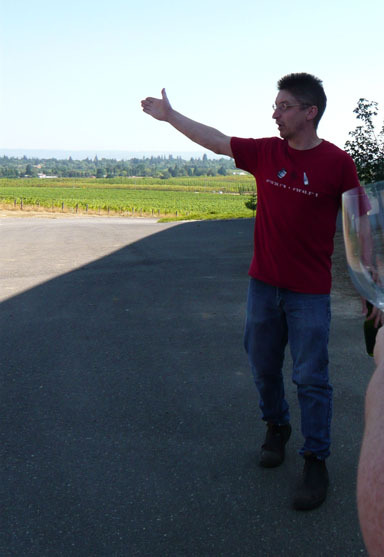 Stephen Webber, White Winemaker, takes us on a tour of the vineyards. Stephen joined Montinore in 2006 and spent three years as Assistant Winemaker before taking the promotion of Winemaker in 2009, alongside Ben Thomas. Stephen came from DiStefano winery in Seattle, and had previously spent extensive time working and traveling in Australia, where he gathered much of his larger-scale winemaking experience. A vintage in Alsace, France sealed Stephen’s love of cool-climate white varieties, and he is passionate about the winery’s Gewürztraminer, Pinot Gris, Müller-Thurgau and Riesling. One of the vineyards in the morning light. Here, we were poured the 2011 Borealis (The Northern Whites, get it? ), a fabulous blend of cold-climate white varieties: 38% Riesling, 24% Müller-Thurgau, 23% Pinot Gris, 15% Gewürztraminer. Intensely aromatic with green apple, at 11.5% and $11.69/bottle this is HIGHLY RECOMMENDED and my new house white wine favorite. Making wine involves a lot of care, attention to detail, and hard work! Ben Thomas, Red Winemaker, joined us and with Stephen co-conducted the rest of the tour. 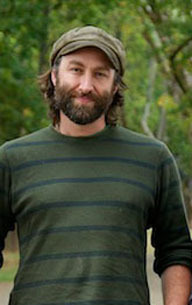 A red wine fan since childhood, he got into winemaking via his mother, a winemaker in Washington state. 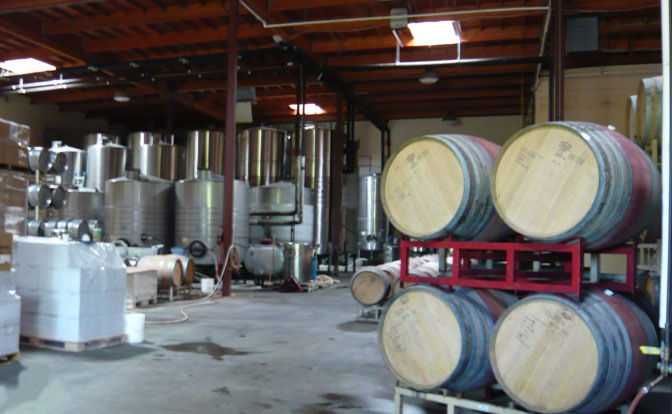 With Montinore since 2008, he focuses on their award-winning Pinot Noirs. With a varied and fun background that includes journalism, Ben contributes to the Montinore Estate blog. Some of the barrels in the winery. At this phase of our tour, we tasted the 2011 Müller-Thurgau, their first bottling of this variety. At $16/bottle, its crisp acidity was a nice contrast to the softening sweet edge. Aromatic with citrus and spices. 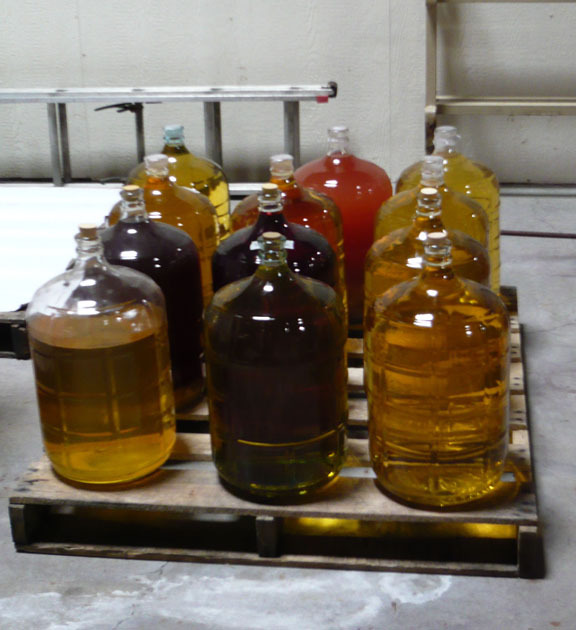 More barrels … stainless fermentation is done, too. In a very practical way, records are kept of each barrel’s annual use. The barrels are French and Hungarian. Next up was the 2011 Rosé of Pinot Noir. Bright salmon color, strawberry nose with hints of dried fruits. Tight, dry but fruity, refreshing acidity. 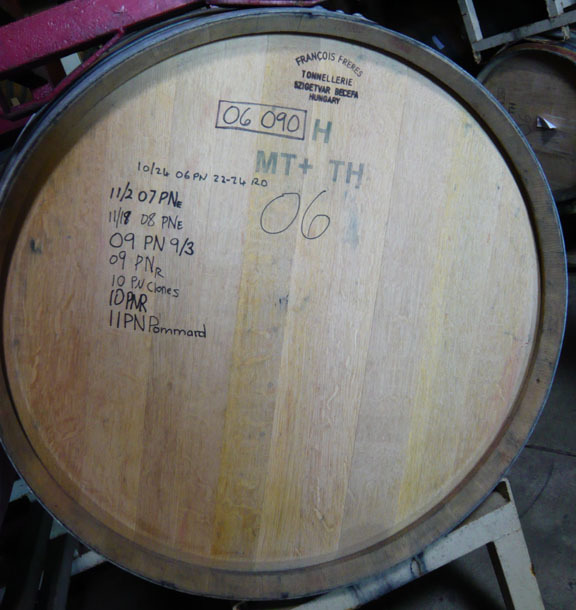 We wended our way back up to the tasting room, where we tasted the 2010 Reserve Pinot Noir. This is a beautiful wine. This young Pinot Noir is clear and light-ruby. Spicy nose, cedar and spice, tannins and spicy finish. $28. 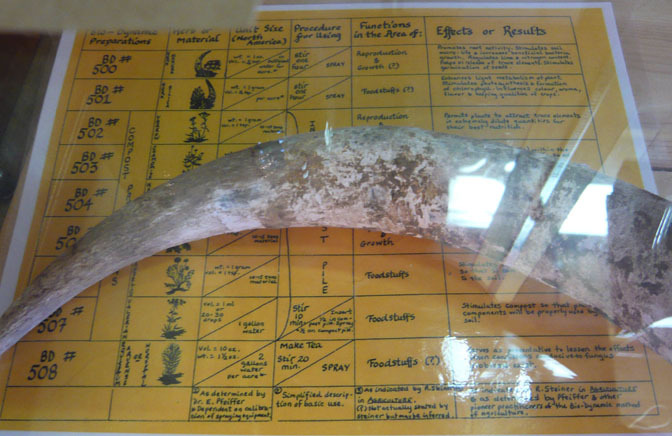 I found this part of the tasting room’s display cabinet to be FASCINATING. One of my favorite wines is Maiwein (May Wine), a German white wine infused with woodruff, creating a distinct and interesting taste. Turns out the use of herbs and spices is not uncommon! 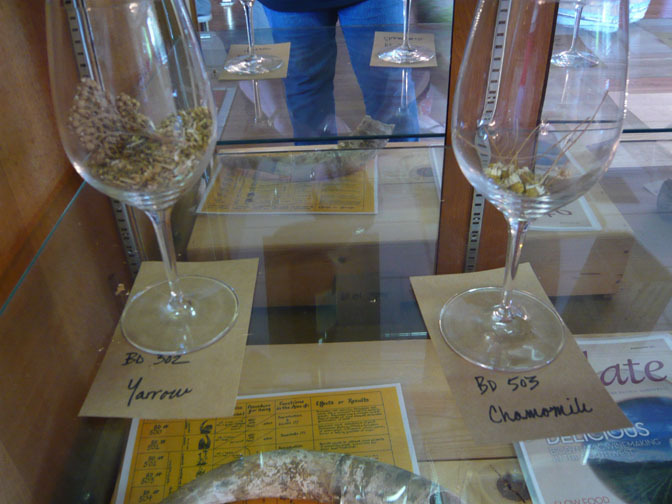 However, in this case (see detail below), the herbs are used in the vineyards. For example, #502, Yarrow, “permits plants to attract trace elements in extremely dilute quantities for their best nutrition.” This is just one part of the cluster of practices used in Biodynamic farming. 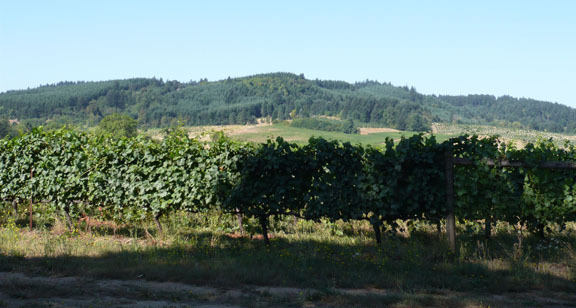 Montinore’s 230 acres “reflect a healthy and thriving ecosystem that delivers wine reflecting a sense of place–this particular place in a far north part of the Willamette Valley that produces fertile ground for wine grapes and other agricultural crops. Guided by the principles of Demeter Certified Biodynamic farming (receiving our certification in the summer of 2008), our vineyard team carefully coaxes exceptional quality, flavor and nuance from our grapes.” Yet, Montinore is among the state’s top 25 producers in terms of number of cases. 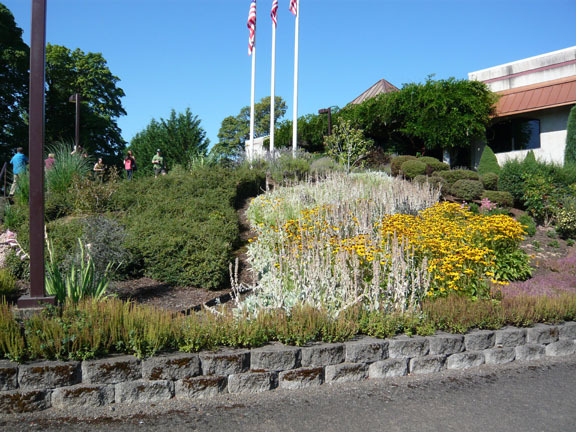 This entry was posted in Gewurztraminer, Müller-Thurgau, Oregon, Pinot Grigio (Pinot Gris), Riesling, Tastings, Technical Stuff, Travel. Bookmark the permalink.